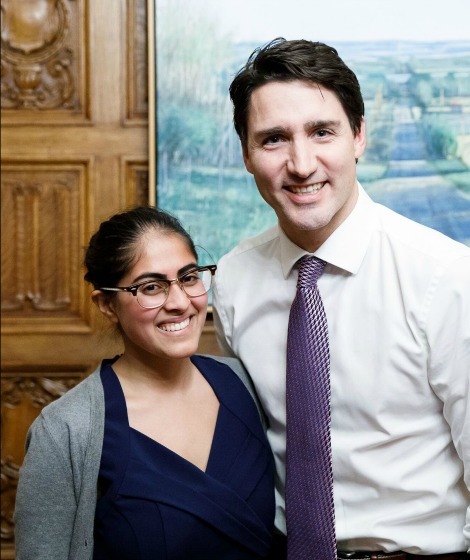 By Costa Maragos Posted: January 5, 2018 8:00 a.m.
Avnee Paranjape, an alumna and recipient of the President’s Medal for academic excellence and leadership at the U of R in 2016, thoroughly enjoys walking the corridors of power on Parliament Hill. 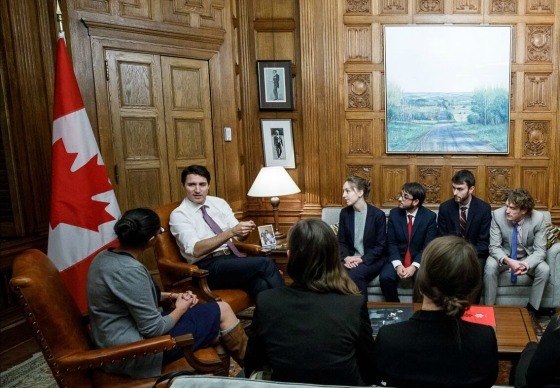 Paranjape is one of 10 parliamentary interns in Ottawa and, based on her experience, encourages current students to apply for one of the positions. ”Parliament Hill is an exciting, bizarre, and wonderful place to work. It's so neat to see something happening live in the House or during a committee meeting, and then see it as a news story later that day,” says Paranjape. The 10-month internship began in September 2017 and will run until June 2018. Paranjape, 24, graduated from the U of R with a Bachelor of Arts Honours in English and a Bachelor of Science in Biology. She earned a Masters of English at the University of Toronto. She jumped at the opportunity to work in Ottawa. The Parliamentary Internship Programme has been around for 48 years. Interns work fulltime for both an opposition and government member of parliament. They assist MP’s with committee work as well as drafting speeches, press releases and private members bills. The job includes study tours including a visit to their MP’s ridings. From October 3 to December 15, 2017, Paranjape worked with Bev Shipley, the Conservative MP for Lambton-Kent-Middlesex. Her second placement begins at the end of January when she will work with Mary Ng, Liberal MP for Markham-Thornhill. Paranjape, a U of R alumna. Photo courtesy of Adam Scotti. Paranjape and her fellow interns have visited Quebec City to observe the Quebec National Assembly. They are now in Europe where they're learning about the Scottish Parliament, the European Parliament, and the British Parliament. There are also plans to visit Washington, DC, and Nunavut. There is a requirement for the interns to write a final research paper. Time is also set aside to meet with senior policy-makers, diplomats, journalists, scholars, politicians and leaders in civil society. Then there was the sit-down chat with Prime Minister Justin Trudeau. Paranjape encourages U of R students to apply for one of the coveted 10 intern positions. The deadline is January 31, 2018. The program is open to anyone with a degree in any field (completed by September 2018). “I almost didn't apply because I thought that I had no chance of being selected, so don't sell yourself short. The Parliamentary Internship Programme values all kinds of experiences and backgrounds, so do take the time to apply. The program needs more western representation. U of R students should definitely apply,” says Paranjape, whose plans include attending law school. She also remains open to opportunities the internship might bring. “I still get chills every time I step out of Centre Block in the evening and look over my shoulder at our Parliament. I can't believe I get to work here,” she says. Interested in an incredible experience working on Parliament Hill? Visit here for more information on how to apply.